A sharrow at the end of a dead end street? Photo: Streetsblog. Behold, in the photo above, San Francisco bicycle infrastructure, at the end of St. Charles way, where it deadends at Brotherhood Way in Oceanview. There’s a walking path at the end that leads to Brotherhood Way. There’s a large curb. Exactly what this sharrow marking is supposed to accomplish is difficult to imagine. Perhaps a Streetsblog reader has an idea. 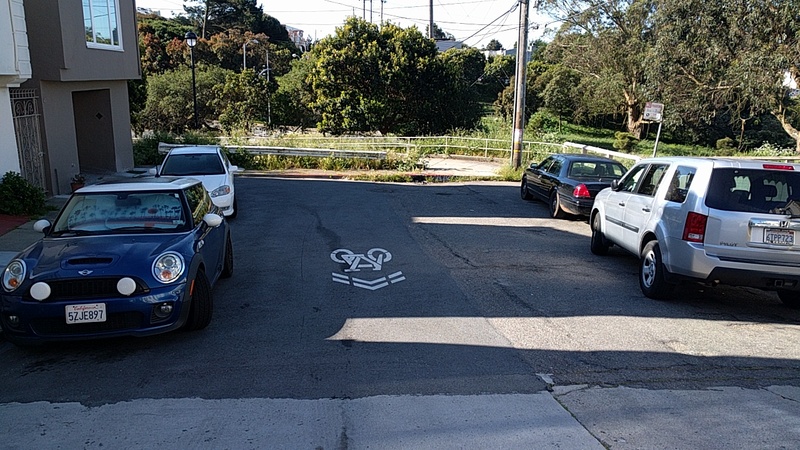 Most likely, the sharrow is painted there simply because a crew was told to go paint some sharrows–because, cycling. Tomorrow is Bike to Work Day throughout the Bay Area. It’s an opportunity for everyday cyclists to encourage their bike-curious friends and for new cyclists to ride with a group. It should also be a great deal of fun. Streetsblog California did a great breakdown of all the events in the Bay Area. It is, of course, all about getting more people into the healthy habit of cycling. But promote cycling all you want, if the infrastructure is sub par, we’re never going to turn cycling into what it could be–a hugely significant and perfectly safe transportation option for everyone, including children and the elderly. You know, like it is in much of Northern Europe. That’s why Bike to Work Day presents another opportunity for Streetsblog readers: let’s use it to take a look at how the Bay Area is doing. What are you seeing when you ride your bike? Do you see signs of improvement all over? Or are things in your district not advancing the way they should? Send your observations to tips@sf.streetsblog.org or drop us a line on Facebook or Twitter. Let us know, with photos preferably, where is Bay Area infrastructure working? Where is it failing? And what could be better? Streetsblog will be riding from Oceanview to City Hall tomorrow morning with a commuter convoy. Come say hello. After the page break, enjoy some examples of our favorite bike infrastructure fails (and a couple of successes). Who doesn’t love painted bike markings and crosswalks? They’re both really useful if you want to park your van or truck and buy a juice at Santa Clara Natural Market. Photo: Streetsblog. 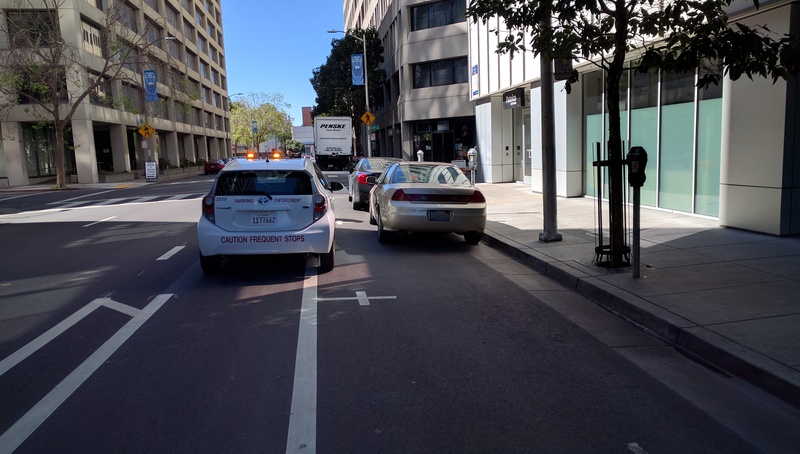 Some people say we just need better parking enforcement to keep Oakland’s Webster Street Bike lane clear, but Streetsblog isn’t so sure (in case you missed it, that’s a parking enforcement car parked in the bike lane, right in front of an open spot). Photo: Streetsblog. A rare section of SF bike lane without a car in it. Could it have something to do with the concrete divider? Photo: Streetsblog. 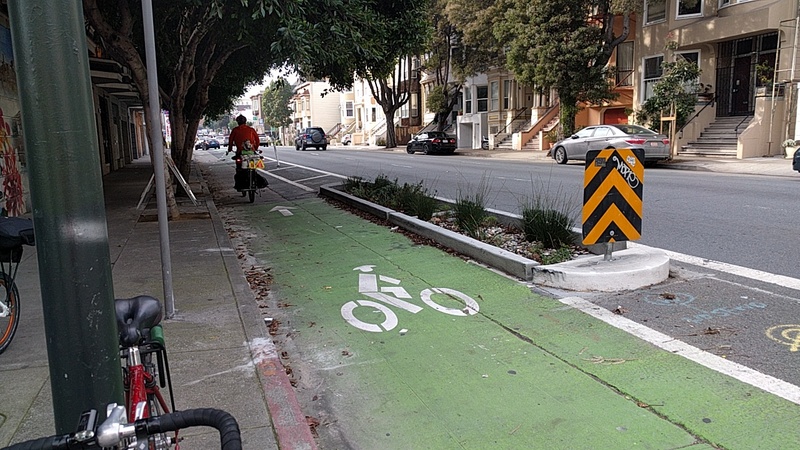 A raised, parking protected bike lane allowing San Francisco cyclists to ride in serenity. Just kidding. That’s Denmark. Photo: Streetsblog. Sad example of how Streetsblog coverage has devolved as of late… a quick google search confirms St. Charles may be a dead end for motor vehicles but is open and offers pedestrian/bike access across Brotherhood Way (as shown in the picture, admittedly without a curb ramp to easily facilitate that access). The article does say “Perhaps a Streetsblog reader has an idea” and you have delivered! I think the point remains that putting a sharrow in that little segment wouldn’t seem to have much impact at all. In Piedmont we now have sharrows painted literally in the gutters, in a naked attempt to force bicyclists to ride on the extreme edges of the roadway. I will take some pictures tomorrow. No arguments that it seems a bit silly at first blush, but I feel like Streetsblog used to offer more thoughtful critiques. I just double checked at https://www.sfmta.com/maps/san-francisco-bike-network-map and St. Charles Ave is actually an official SF bike route. Just like the Wiggle may not be intuitive, my guess is that this route is far from intuitive to [any] riders and so the Sharrow makes a fair amount of sense (again, even lacking curb cuts). The point of my initial post was that it just strikes me as lazy to make fun of obscure but quasi-thoughful sharrows as opposed to incredibly inadequate infrastructure on super popular routes, such as awkward supersharrows running diagonally across Market in the middle of Van Ness (intersections are my favorite places to change lanes) or the new bike counter on Valencia between 16th/17th that will maybe count 2/3rds of riders due to double parking. One thing I’ve been noticing more of recently is motorcycles and scooters riding in the bike lanes, especially when car traffic is stopped and lined up at a light and the motorcyclist thinks they can use the bike lane to blow by all the stopped cars (and they’re not turning right when they do thus, but getting back into the traffic lane to go straight ahead usually). Not only do I find it nerve-wracking to have such a powerful vehicle right next to me, but the exhaust fumes and noise is really repulsive. Would love to see SFPD to a crackdown on this sort of thing. 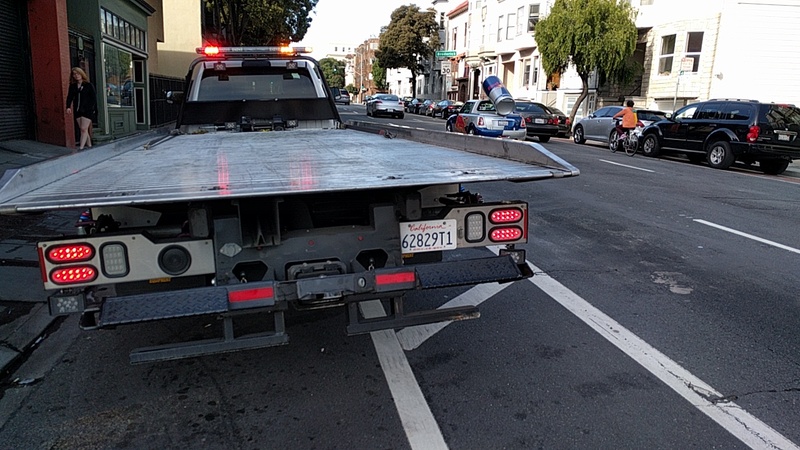 Of course, it’s a well-known fact that SFPD doesn’t do any enforcement, let alone crackdowns, against actions that endanger bicyclists since they are apparently second-class users of the roads …. Funny you chose St Charles and Brotherhood as the lead photo – tomorrow San Francisco State’s Bicycle Geographies class (which I’m a part of) will be giving a presentation on how to improve that route, and bike mode share in general. St Charles to 19th to Beverly to Holloway is the most common way that students at SF State get from BART to campus. I invite all Streetsblog readers to come, it’s from 2:10 to roughly 3pm in HSS 287! Thanks for the heads up and invite and I’m curious as to what your proposals are. The existing arrangement seems safe and it’s a nice car-light route but it’s cumbersome, with its climb and lack of a curb cut, as mentioned. Yesterday, when discussing a bike lane next to parking in San Francisco, the author called it a ‘death door lane’. 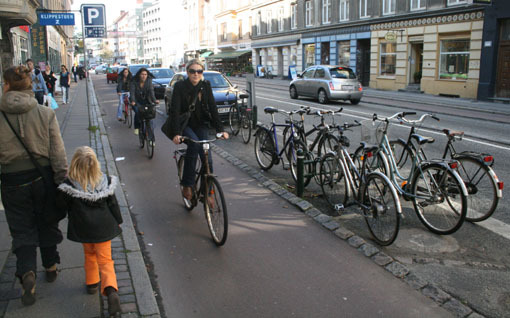 Now, when showing a bike lane just as close to parking in Denmark, it is a serene paradise. You can still get doored in Denmark. Cutting and pasting from Denmark to SF isn’t going to make all the problems go away. Whenever possible, bicyclists should physically impede motorcycles from illegally traveling in bike lanes. Force them back into the lanes they are legally required to travel in, slow them to a crawl–if there is no longer any advantage to breaking the law, they will stop. Those are passenger side doors and less likely to pop open compared to the driver side doors on 99% of USA’s bike lanes that parallel parking. That was my first thought too when I saw the photo. and it’s known – “I am stepping out into a bike lane, look for bikes” whereas the typical configuration here is “is there a car back there? OK no here we go!” And the bike lane gives a buffer that signals that in fact there are no cars there. I walk this frequently. I can’t make the talk, but the changes I think would make a big improvement are: when you push the ‘beg’ button to cross Brotherhood, it shouldn’t take a minute or so to activate the cross signal; and concrete barriers protecting the pedestrian refuge from the 3 lanes of northbound traffic that veer alarmingly toward waiting pedestrians as they turn from Junipero Serra onto 19th. If you’d consider sharing this at the talk, I’d appreciate it! I just saw those new sharrows on Moraga. There are already plants draped out halfway onto the sharrows in some spots! And that’s what they look like when new! This embarrassing empty post of mindless drivel further proves the descent of SF Streetsblog into bad advocacy and worse writing. All the photos are of improvements that DO help bicyclists. Sure, drivers use them wrong, but I’m not convinced that bad drivers are enough to validate childish insults of real improvements. And while you left the door open to backpedal into “that’s why we’re asking the public,” your tone is cynical rhetorical judgment. Can this even be considered journalism? Let’s ask the pubic. Is there really so little to address in SF transportation that complaining about progress (as endorsed by the SFBC) is predictably tiresomely lambasted as “not enough?” So…incremental progress is not enough? Fascinating. This isn from insightful discussion, hardly even thoughtful. It’s just a soap box with a line-up of idiot speakers…or an idiot speaker on repeat. Thankfully more reader comments and people I’ve talked to, recognize how far this has fallen. Hopefully someone at Streetsblog who can make a difference will recognize it too. That’s right, more people fighting it out on the streets will solve all our problems. Interestingly, the Scoot Network folks say that their scooters are legally mopeds and therefore technically legal to ride in bike lanes, but they tell you not to do it (and not to lane split). I mailed the city of Piedmont about this already. It would help if multiple people contact them. Don’t be hard on Streetsblog. The former editor/main guy for SF was Aaron Bialick. He moved on. Give it some time to find its voice again. I’m just really pleased to have such clear advocate there for non-vehicular transportation and livable streets. Ok. Snail mail, or email? If email, what address? Or mistaking bike counters for bike infrastructure 🙂 Is there a reason we need a counter in both directions on Market at 10th? This member of the public wholeheartedly agrees. It is too much to expect 100% understanding of the design, especially from children. People get hit crossing the parking protected cycle track in Golden Gate Park. As a cyclist, I feel particularly uncomfortable when I’m going faster on the downhill portion of the parking protected cycle track. I have had plenty of people cross in front of me without looking. Buffered bike lanes have their issues but I prefer not being boxed in, having nowhere to go if something unexpectedly enters my path of travel. Censorship alert! My comments that discussed flaws with parking protected cycle tracks and pointed out a made up statistic from another commenter have been removed. So disappointing to see how far streetsblog has fallen. Our big capital project ask was to build a bike/ped bridge across Brotherhood Way from Payson&St Charles to Chester St., similar in design to the “Snake Bridge” in Copenhagen (link below). It would eliminate a huge amount of elevation gain/loss on the route, and allow cyclists and pedestrians to avoid waiting to cross Brotherhood Way. 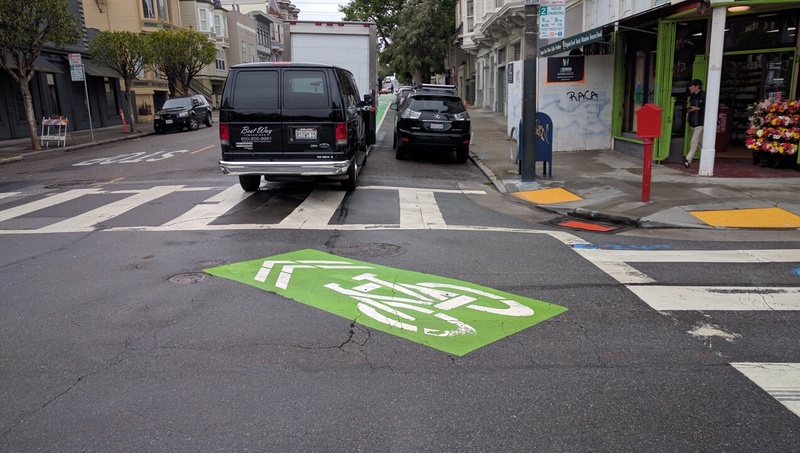 We of course also asked for more obvious things – like green paint, bicycle boulevard treatment on Beverly, BayAreaBikeShare stations, and more accessible secure bike parking. Thanks, Josh, for the info – and great proposals to improve bicycle infrastructure! I wonder if bike lanes continue to expand whether there will be a booming market in mopeds, electric bikes and other forms of motorized bicycles. In any event what Greasybear is suggesting is illegal, which I suspect he wells knows. Agreed, and in fact I think Streetsblog has gotten better of late. I posted a comment. It was deleted WTF SF Streetsblog? Can you tell me why that was removed heres what the post said: SFStreetsblog has been pretty disappointing lately. Childish insults of actual improvements to the bike network because drivers used them badly isn’t helpful. The tone is hostile and judgmental where it should be constructive. There are lots of things to talk about in Sanfrancisco Transportation besides lazer ficus for protection bike lanes, which also have problems and aren’t a magic bullet. Please explain why this original comment was censored.